Travel into the lap of nature! For the city folks and our kids, we love our holidays in the lap of nature but demand all the amenities we are so used to. Hence our kids must have their tellys with cable. There must be good A/cs and the husband has to have internet for his daily dose on the smartphone or tab. Of course, the kids need their electronic gadgets too for their video games. Uff, so in between all those, we steal some time for the pool, beach or the mountains. Dismayed by this trend, last October, I booked a family vacation in a quaint little retreat in awesome Coorg. The place sounded straight out of medieval ages. Located in the middle of nowhere a bit of a distance from Madikeri city, the place had no TV, only solar power, very limited electricity, and no mobile connectivity either. There were no hotels and certainly no people nearby. This was our “Back to the Nature” trip! So, armed with books, board games, badminton racquets and lots of inquisitiveness, we left in our car for a 5-hour journey to our destination. With precocious 11 and 7 year old kids, I was apprehensive about how they would take the vacation. Add to it, the extended rainy season last year. But the lovely part was the lush green trees and plants along the route making it scenic and so very pretty. Well, we reached this retreat in the mountains on a lovely, downcast day. All the meals had to be had at the place simply because the closest eatery must have been kilometers away. The place was spartan. The plantation thick and lush. The most beautiful part was a clear water stream that went through the retreat. It went by right next to our cottage. And the sound of the stream was just like sitting next to the waterfall. It was soothing beyond words can ever explain. While the kids loved prancing around in the chilled water, I enjoyed curling up on one of the chairs and reading a book absentmindedly, thoughts wavering many times. 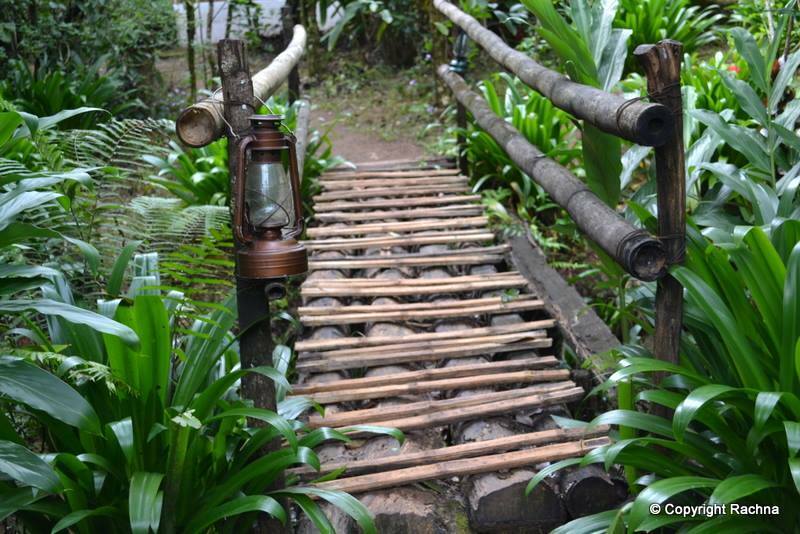 The little stream had its own quaint bamboo bridge with old fashioned oil lanterns. The cottage had only solar lighting. It was thick in the middle of jungle. And even solar lights had to be out by 9 pm to avoid insects from converging on to the cottage. The cottage itself was built in olden style architecture. It had a fireplace built in traditional Coorgi style. Even the water heated twice a day for our bath was done in old fashioned Coorgi way. Each little simple detail was fascinating to the kids. 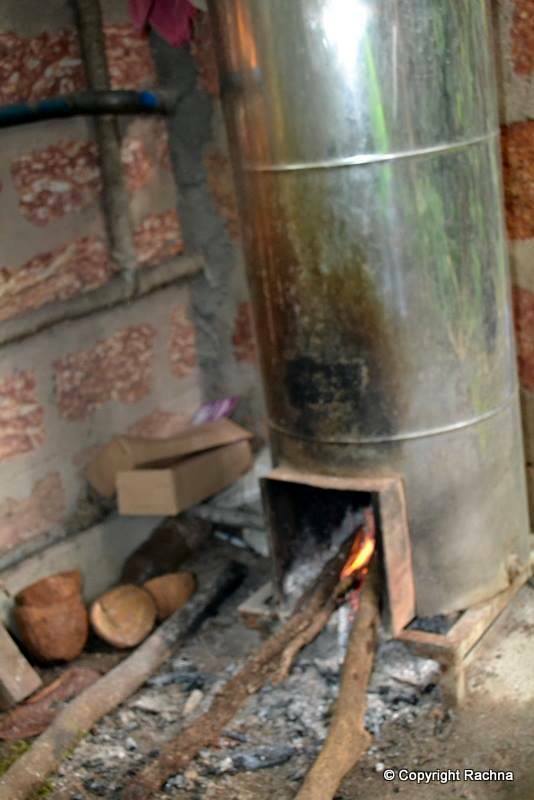 Water boiler in the Coorgi style for heating water the old-fashioned way. There was a languid flow to our routine in this place. The owners, a passionate organic farming couple, were warm and hospitable. They had a fleet of German Shepherds. And the one who stayed in our side of the plantation was Venus. A friendly dog, she filled in for Coco whom we had to leave at the boarder’s. Since none of the usual stuff was available, there was a lot of chatter and easy camaraderie among the guests who were an eclectic lot. The dining area was a cozy place with stone tables and benches kind of arrangement. Everyone sat and ate together. 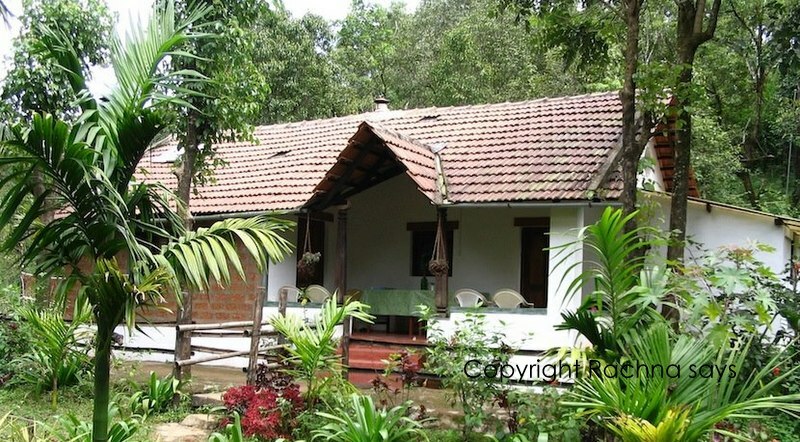 The manager was an avid biologist who regaled us with tales of reptiles in the Western Ghats. The intern, a French citizen, was a friendly young man very good with kids and had some tales of his own. My sons took to him instantly having long chats and learning from him about his pet passion, frogs and spiders. He also taught them how to catch leeches and frogs. Kids found a great friend who took them closer to nature. My sons grew so comfortable around the reptiles and insects, it was tough to believe. Well, even the mother wasn’t immune to an increased comfort. Since it was still raining, the roads were infested with leeches. A local at the Retreat took us on a long trail, steep in parts to a lovely view point. On the way, he pointed some exotic plants and trees to us. 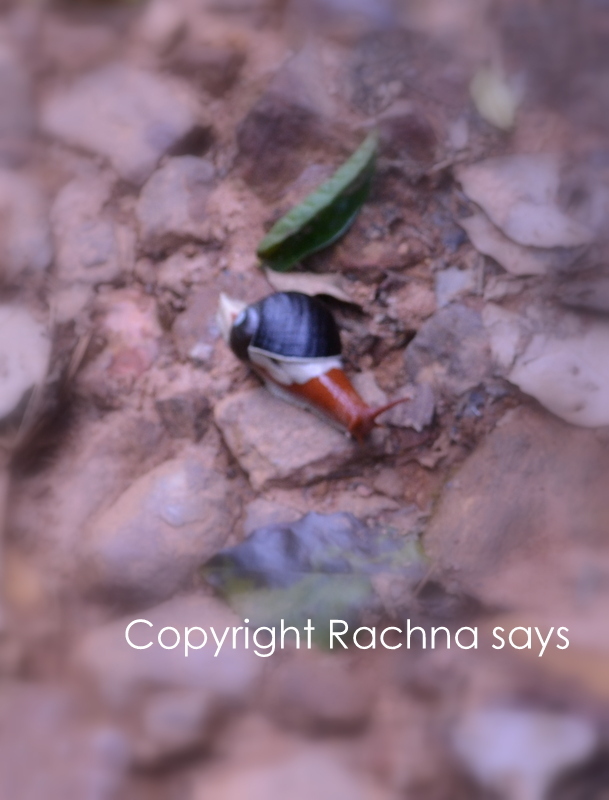 We also found this snail, indigenous to the Western Ghats here. 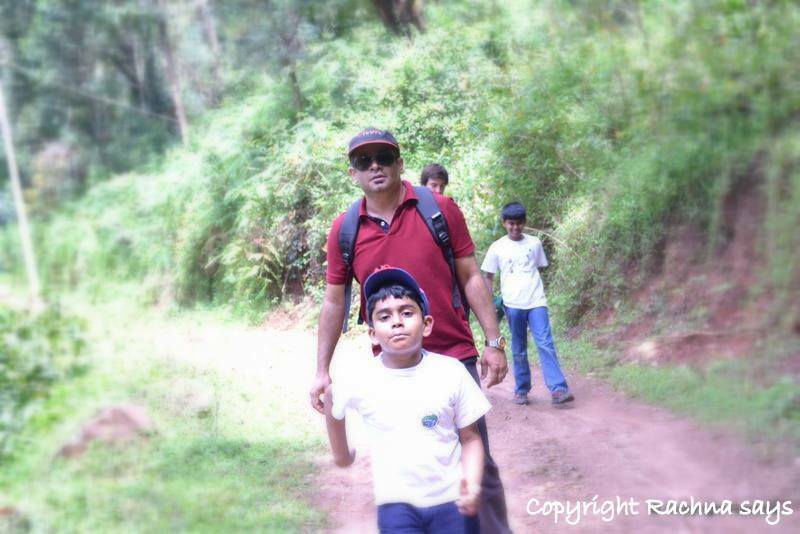 My husband and I have done many treks but this was the first time, both my kids were doing it too, and it was almost 8 kms and steep. 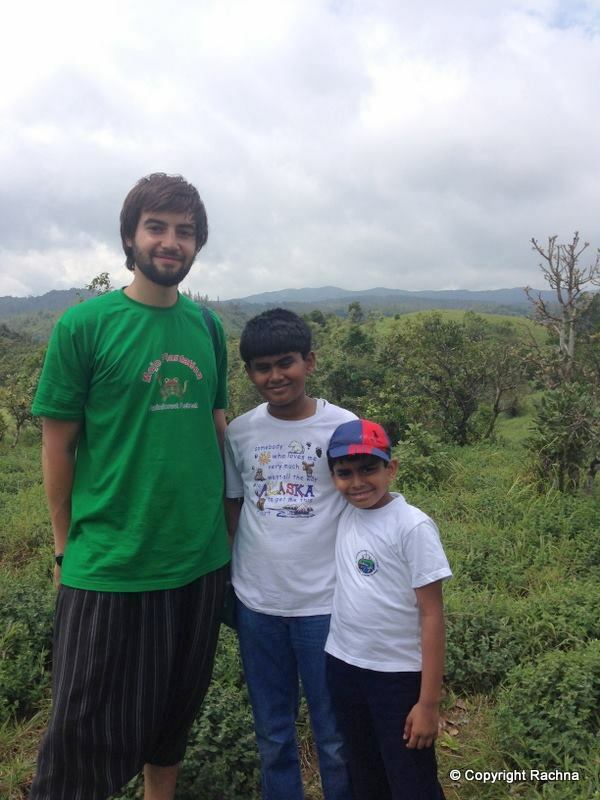 Thanks to the real life lesson, my sons Gautam and Sid learned much more than they could through many geography lessons. Leech — yes that one! 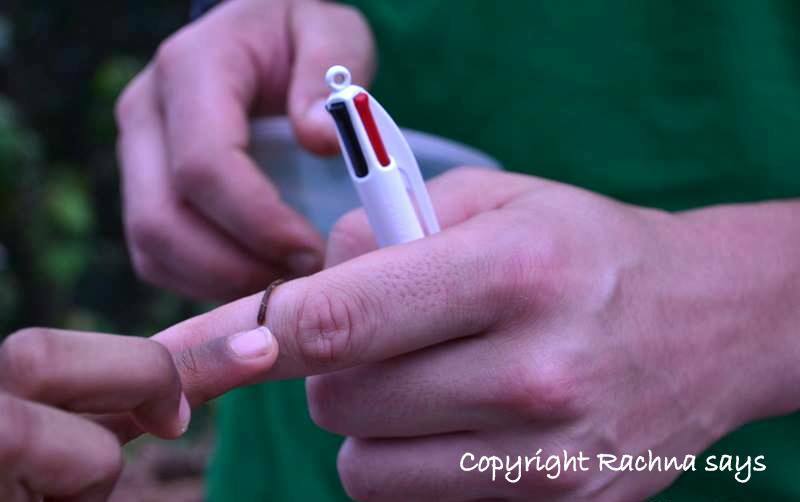 My younger son who is completely fearless helped his friend catch leeches and put in a plastic box. He wanted to take them home but dropped the plan after much persuasion from me. He also learned how to catch baby frogs with bare hands. Here we go trekking together. We watched a documentary at night on King Cobra after which we dreamed of hissing snakes everywhere. Yes, the plantation regularly has snake visitors. 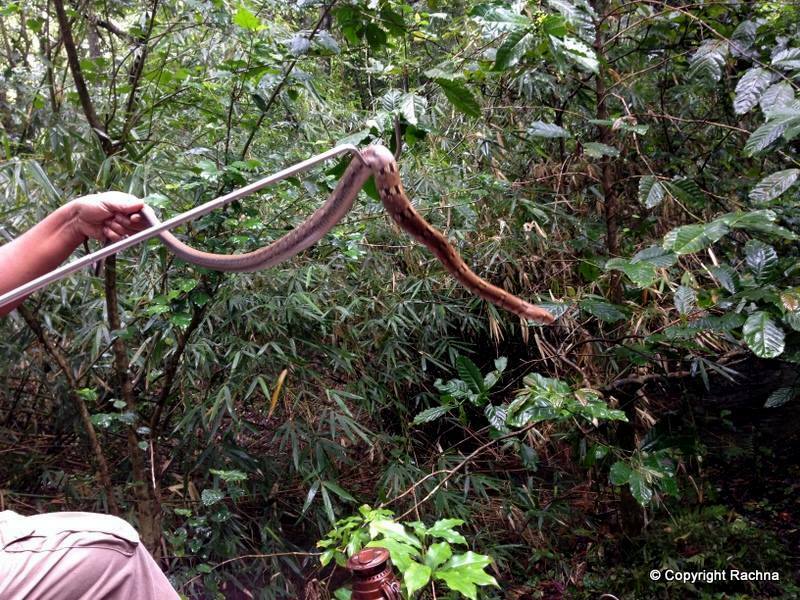 They had caught a couple of them – a venomous and non-venomous one. The Manager who was an expert at snakes brought the non-venomous one to show to all. The kids even caught its tail. I could see that the information and real handling was making them comfortable around the otherwise scary reptiles. There was a small pond which had loud mouth cackling geese. The owners told us some interesting facts about geese. About how they loved living in pairs and were fiercely loyal to their partners. They also made good ‘watchdogs’ as they cackled every time someone came in. Watchdog geese avidly watched over by my son. The kids were already exposed to organic farming as my husband is an avid organic farmer. We have a lovely terrace garden at home. But here in the plantation, there were activities for the kids and the adults. 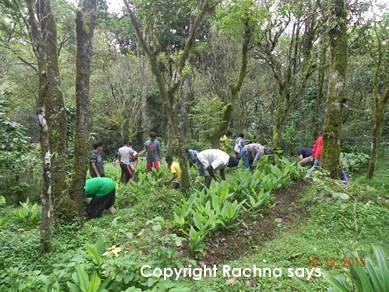 So, we all got to de-weeding around the turmeric and ginger plants. Kids actively help adults in de-weeding! These weeds were then used in the cow shed to cover the floor. They also went into composting. The kids watched everything avidly soaking in information, getting closer to Mother Nature one step at a time. They have a lovely biogas plant too. They had vanilla and coffee, pepper and cardamom plantations.They also grew many vegetables and fruits that later came on our plates for the meals. And then there was this amazing variety of flowers. 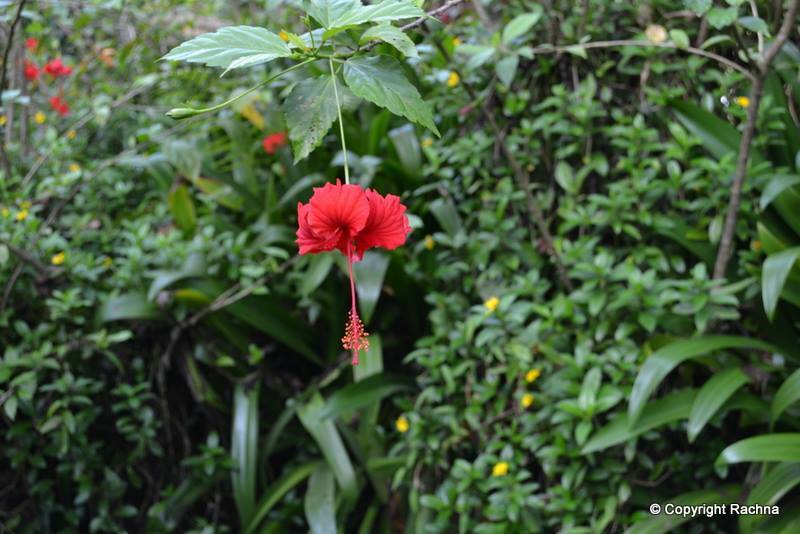 Lush, bright and large as they are wont to be in unspoiled, organic environment. The owners also held sessions for us where they answered questions about organic farming, something that was of great interest to all of us. Yes, we also bought some organic produce from the plantation including coffee and spices. And in the 3 days that we were there, we met a Swiss couple, a Canadian French family from Bangalore, a large family that had converged from Tamil Nadu, Bangalore and Kerala, a Wildlife Photographer with Lonely Planet who was traveling from Bangalore and of course our French intern friend from Paris who had roots in South America, Spain and France. So amid all these wonderful people and things to do, the kids did not somehow miss their obsessions. The husband grumbled a bit but did fine. And, it must be a record of sorts that I did not log in for 4 straight days. We did not do any touristy running from one must-do point to another. The itinerary unfolded on its own. This time we did find time to stand and stare. With warm memories in our heart and learning that no classroom could have taught, we headed back to the concrete jungle we called home. I am tempted to venture out again to a similar locale soon because I know that the kids are raring to go there -where the paths are not tread often and the itineraries are unique, and all relationships with nature are 100% real. A foodie vacation in Old Delhi! 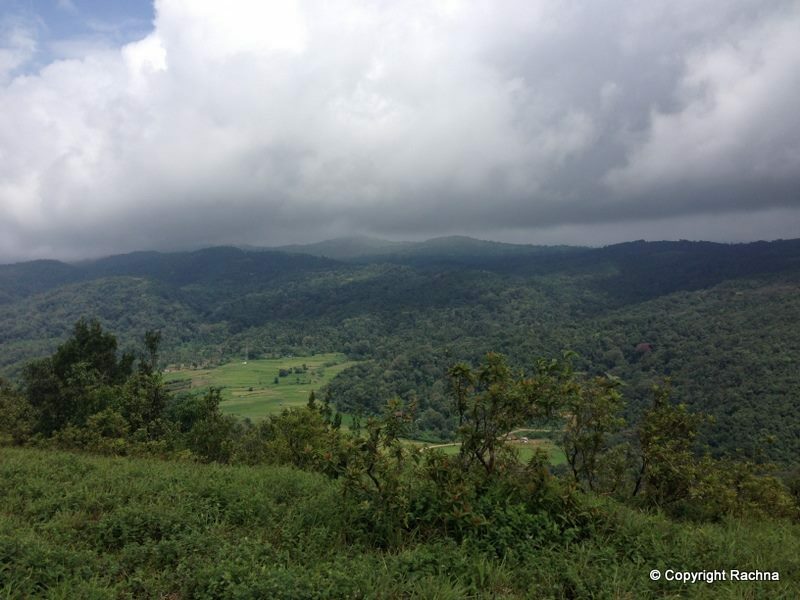 Scenic Wayanad — the vacation begins! Seems to have been a very interesting trip. Best of luck for the contest. It really was! Very different. Thanks a lot. Sounds like an idyllic getaway. Just what we need to recharge ourselves before we get back to the humdrum. Yes, it was. Quite a lot of fun too. I loved sleeping a lot, really peacefully in this place. Sounds like you had a great time Rachna ! And in locales like this, TV or any modern gadgets for children is a sacrilege. That way, kids are sure to get more absorbed into nature than city life would ever permit them to do. Thanks, Ash! I do agree that these places are best enjoyed without gadgets etc. I have really reduced my online presence restricting it to bare minimum and learned that I can survive. So I guess I can do with such a vacation. hehe Let me assure you that I am really afraid of snakes too. 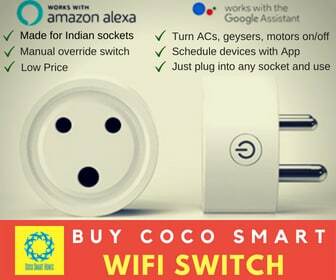 I think you must give it a shot next time you visit India, Bhagya. Wow fabulous post! I am longing for such a break now! Looks like you all had a great time, very beautiful pictures! Thanks, Aditi! It was a great getaway. I love this place from your explanation! No TV, no phone, no internet…Nice! Will plan soon! Thank you! We had been to Munnar last year and stayed in a Tea estate. It was nearly like this. We enjoyed. Our next trip is to this place! Wow, Sandhya! Munnar is on my list too. I will forward you the details of this place if you want. It was a very different trip for sure. Nothing like connecting with nature and making the new generation aware of the abundant god’s gift to us. Best of luck for the contest, Rachna! I agree, Rahul! Thank you so much! Coorg is simply beautiful na? Thank you, Pixie! Yes the vacation was great fun! I need a getaway like that! I am so tired of the monotony of work! SIGH! hahaha Vacations are really rejuvenating. I am on one currently :-D. He was really cute, btw and had loads of tales to tell to us too :). Jalo jalo! I travelled along with you. This was so vivid, more so with the pictures. 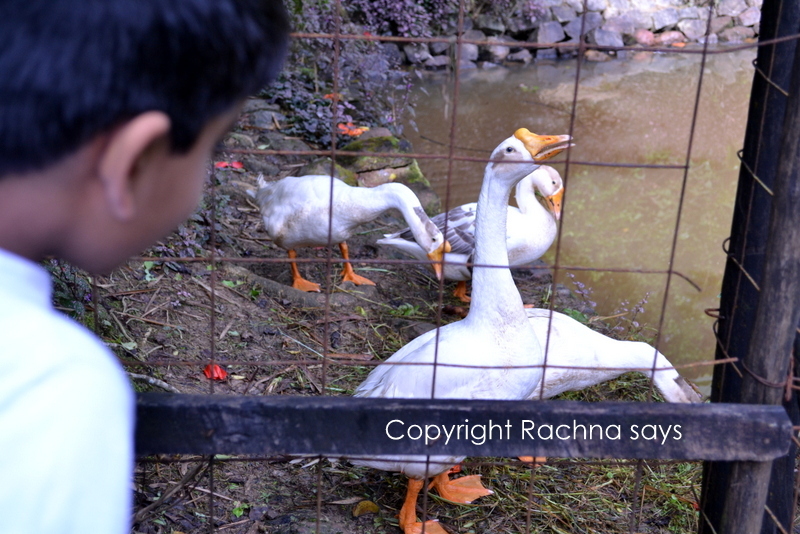 Rachna, your kids are at an age where they can imbibe so much from such nature trails. I remember when we planned to visit the back waters of Kerala, a big argument ensued. My Goutam, then 18, refused to leave his laptop at home. His dad was maha upset. Finally he came along with us minus the lappy but sulked all along! Thank you, Alka! I can understand what you are saying. These gadgets are becoming huge pests, a sort of an addiction that they can’t shake off even for a few days. Luckily, this trip was really unique in that sense and we all had great fun. Thank you for reading and liking the post. That’s great, Rekha! I loved the pics of the vacations you had shared with us. Glad to know that you enjoy your vacations reconnecting with nature. I hope you travel to Coorg too some day. You will love it. Thanks for reading! Indeed, it is one of the nicest ways to spend a vacation. Though, there will be resistance to the idea to begin with for sure. Thanks for reading, Ilakshee. Beautiful Coorg..you have lapped up this piece so beautifully Rachna! It is indeed interesting and worth exploring. Sometimes these kinds of vacations are so much fun. Yes clean toilets, neat and clean surroundings and clean, freshly cooked hygienic food is what I can’t do without. The rest can be managed without. Thanks for reading, Ash! I will msg you the details of the place on FB soon, Seeta. I am just logging in once in a while. Pretty much offline otherwise. Thanks for reading :-). Could you FB msg me the contacts of that place Rachna? My sis wants a Coorg visit this time with family when they come over in June. I am in Dalhousie now and was remembering your annual treks to Himalayas. This is certainly your type of vacation for sure. I will message you the details in a couple of days when I am on my system again. Thanks for reading :-). Through your description coupled with perfect pictures, this place seems to be awesome! During my stay in Himachal Pradesh, I also tried to explore such places filled with natural beauty. Glad to know that you are in Dalhousie now. It is also one of my favourite destinations. We (me along with family) have visited it many times. I like to spend time sitting in Khajjiar, enjoying the nature. Thank you, Ratna! Yes, Dalhousie was lovely. I am back in Bangalore now and have beautiful memories of the trip. Thanks so much for reading! This looks wonderful! Thanks for sharing your lovely memories. Followed you on Twitter so I can read more travel gems – hopefully see you there sometime! I enjoyed reading this as much as,perhaps enjoyed the trip. Thank you so much, Chowlaji! Wow! What a wonderful holiday. Its so important to get our kids to learn about and appreciate Nature. This is essential so they can stay grounded in the maze of a fast paced life, urbanisation and technology. Very true, Archana! I think there is no wrong time to expose kids to nature. 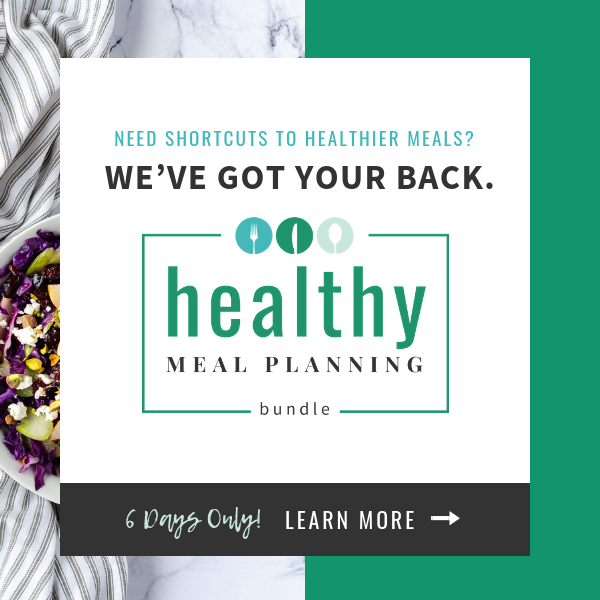 Get your Healthy Meal Planning Bundle at a very low price!